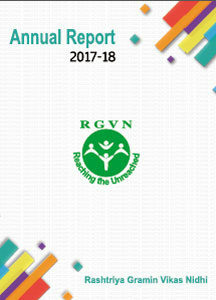 Governance of RGVN is vested in Governing Board comprising of nominees of sponsors IFCI, IDBI, NABARD and Tata Social Welfare Trust, and eminent persons from the banking and development sector. The Chairperson is nominated by IFCI. The Executive Director is entrusted with the responsibility of overall administration of RGVN, and is stationed at its Head Office at Guwahati. He is also an ex-officio member of the Governing Board. He is assisted by a team from the Resource Unit, HR & Administration and Finance & Accounts, and integrates operations, develops plans, policies and budgets and meets statutory requirements. Regional Offices at Guwahati, Bhubaneshwar, Patna and Raipur are headed by Assistant Directors to carry out operations in their respective regions. The Regional offices are supported by Development Support Teams (DST) located at strategic places to offer RGVN’s services to the poor at their doorstep. IFCI Ltd, IFCI Tower, 61, Nehru Place, New Delhi- 110 019 Chairperson Executive Director, IFCI Ltd.